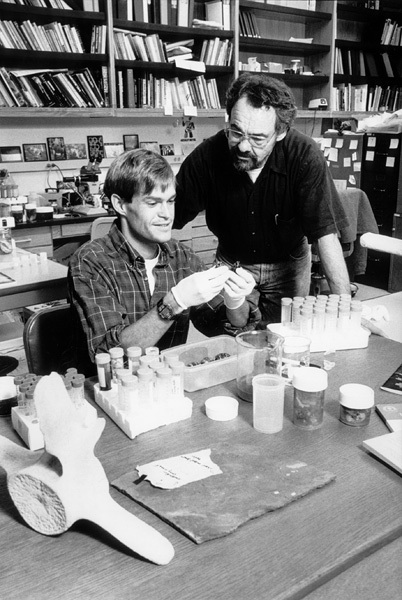 Jere with then grad student Chris Meyer in 1996. Photo by Jane Scherr, UCMP Archives. Dr. Lipps was born in Los Angeles, CA, in 1939. By age six he developed an interest in rocks and fossils and went on field trips with his father, who encouraged his interest in nature. He wrote an essay for his 6th grade class that began, “I want to be a geologist when I grow up,” and that is what he did. As an undergraduate at UCLA, he and Ed Mitchell took many field trips, including one to the Channel Islands where he found a fossil bird skeleton, described in his first paper (1961). The two collaborated on several papers, Jere working mainly on the geology and invertebrate fossils, Mitchell on marine mammals. His advisor in the geology department at UCLA discouraged him from trying to become a geologist, as there were few opportunities for employment at that time. Instead he talked to avian paleontologist Loye “Padre” Miller, who encouraged him to ignore his advisor and follow his interests. Good advice! He was also influenced by Jim Valentine, who encouraged him to write papers on various paleobiological topics. This relationship has continued to the present day and Jere and Jim still have joint projects underway. His graduate work at UCLA in micropaleontology with Helen Tappan and Al Loeblich included invertebrate, evolution, ecology, and protozoology courses. He had summer jobs measuring sections and collecting from the classic Tertiary microfossil localities in California. In 1966 he received his doctorate in geology, and in 1967 was appointed Assistant Professor of Geology at UC Davis (Professor, 1975). Jere has diverse scientific interests, working on vertebrates and metazoan invertebrates as well as foraminifera. He is a Director and past President of the Cushman Foundation for Foraminiferal Research, and served as President of the Paleontological Society in 1997. He served as chairman of Integrative Biology from 1991 to 1994. As a field paleobiologist, Jere has traveled widely in pursuit of fossils. In 1968 he went on a Deep-Sea Drilling cruise to decipher the history of equatorial upwelling systems. In 1970 he started work on tropical foraminifera at Eniwetok, which was continued later in both Moorea and on the reefs of New Guinea. From 1971 to 1982 he worked in Antarctica on foraminiferal ecology and marine ecology. In 1977 he was invited to Aarhus University, Denmark as a visiting scientist to lecture and work with students and colleagues. They made field trips to micropaleontological localities in Norway and also in Russia which stimulated his interest in the Precambrian. Jere made many later trips to the Soviet Union and in 1986 found material which raised the question of the origin of protozoa. This led to a study of Cambrian forams and radiolaria in Moscow, Novosibirsk, and Leningrad, Russia. He worked with Mikhail A. Fedonkin on Vendian fossils resembling jellyfish, which Lipps hopes to correlate with modern organisms at Jellyfish Lake in Palau. In 1992 (after joining the Berkeley faculty in 1988), Lipps and Valentine received a grant from the National Academy of Sciences for research at the Paleontological Institute (PIN) in Moscow. With funding from Dean Joseph Cerny, this led to the UCMP/PIN Exchange program supporting graduate student study trips to Russia. As Director of the Museum of Paleontology from 1989 to 1997, Jere set out to make Berkeley the very best place for paleontology in the world. The reorganization of biological sciences and the renovation of the biology building (1989-94) provided a perfect opportunity. There already existed a strong base with UCMP’s faculty, graduate students, and collections. Under his directorship, the focus was on research with new facilities including histology and molecular biology labs and an Environmental Scanning Electron Microscope, new research collaborations, acquisitions of major new collections, and a reorientation of funding and personnel to enhance student and faculty research. Noting that the long-standing UCMP Open Houses and other public events were extremely popular, Jere also decided to formalize public relations through a self-sustaining program. The Museum website, displays of fossils at various museums, and the acquisition of a Tyrannosaurus rex for the Museum all added to an increased public awareness of UCMP and its science. These changes required input and effort by the entire UCMP community and that was certainly forthcoming. As a result, UCMP was able to weather the severe budget cuts in the early 1990s, the addition and reorganization of staff, and the major disruptions caused by the move to the Valley Life Sciences Building. In 1994, Jere was active in helping to organize the Berkeley Natural History Museums, a consortium of previously independent units: the Museum of Paleontology, Museum of Vertebrate Zoology, University and Jepson Herbaria, UC Botanical Garden, Essig Museum of Entomology, and Hearst Museum of Anthropology. Jere is still actively teaching and doing research, and in recent years has taken an interest in astrobiology. From UCMP News, September 1998, with minor modifications by Dave Smith, 2008.